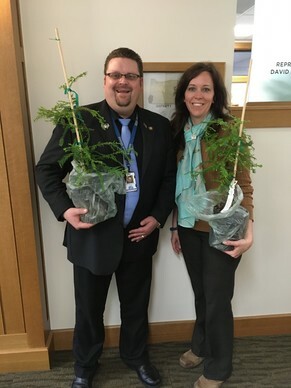 The Champion Coastal Redwood Trees that I presented as gifts (on behalf of the non-profit Archangel Ancient Tree Archive and the Port Orford Rotary) to the Oregon Parks and Recreation Department and the Secretary of State were planted during special ceremonies last Thursday and Friday. 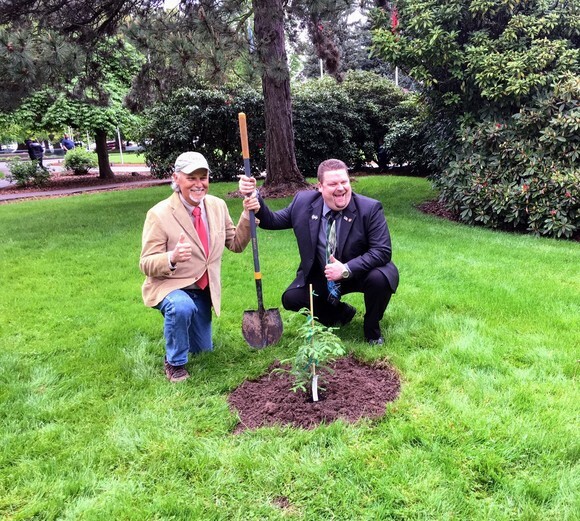 On Thursday, Secretary of State Richardson and I planted a Champion Redwood clone on the State Archives campus. 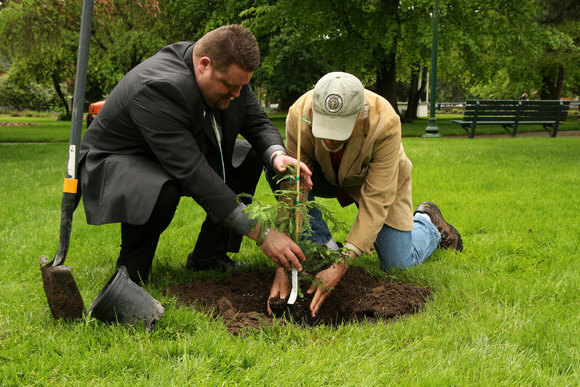 On Friday, we planted a Champion Redwood clone on the State Capitol Grounds near the Walk of Flags Monument. This tree is an exact genetic duplicate of the Fieldbrook Coast Redwood Tree - a 3000 year old giant, cut down over 100 years ago, and whose trunk was 32.5 feet in diameter. The Fieldbrook Champion Redwood would have surpassed the General Sherman Sequoia as the largest tree on Earth. In attendance at Friday's ceremony were my Wife and children, Terry Mock; the Sustainability Consultant for Archangel Ancient Trees Archive, John Suchy, a constituent from Port Orford, Lisa Sumption, the Director of the Oregon Parks and Recreation Department, her staff, my Chief of Staff Shelia Megson, my Legislative Director Marc Miller, and others. I have been involved with the work of Archangel Ancient Tree Archive for a number of years and appreciate their efforts in preserving these magnificent species in Oregon. It is an honor to share this work and these incredible young giants with my colleagues in the State Legislature and the people of Oregon. 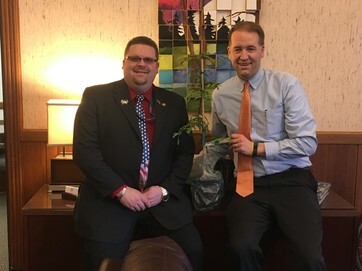 In mid April, Senator Kruse and I, gave a tree to every member’s district in the House, Senate and the offices of the Chief Clerk, the Secretary of the Senate, Oregon Secretary of State, Oregon Treasurer, Oregon Attorney General and the Governor. Everyone was encouraged to partner with organizations in their communities to find a viable location where these treasures can be enjoyed by all Oregonians. Archangel Ancient Tree Archive has used funds donated from hundreds of private individuals to finance champion coast redwood tree production for plantings to further preserve the genetics of the largest and oldest living organisms on earth. For more information about Archangel Ancient Tree Archive please click HERE. Speaking at the Champion Tree planting ceremony. Terry and I planting the Champion Redwood Tree. My Wife, Melissa and Kyndal, Makena, Brayden and Bentley. 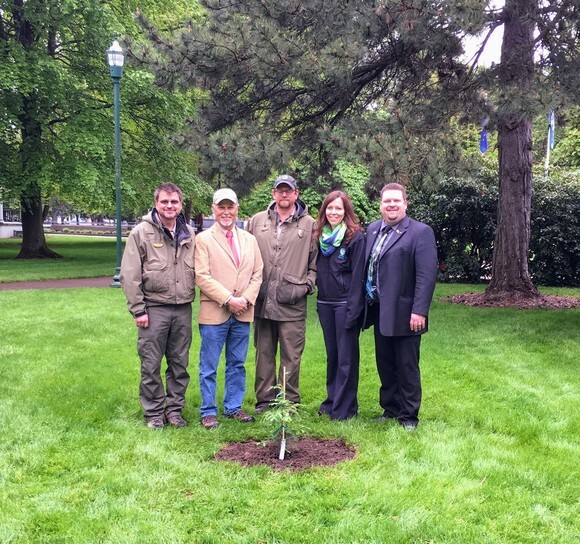 I appreciate their help in planting this champion tree on the State Capital grounds. 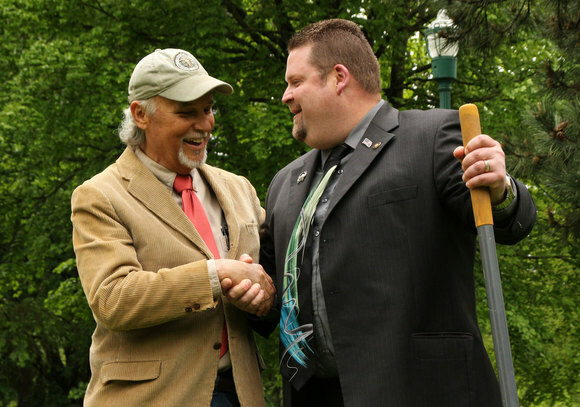 Park staff, Terry Mock and Oregon State Parks & Recreation Director Lisa Sumption. Governor Brown and I in the Governor's private office in the Capitol. 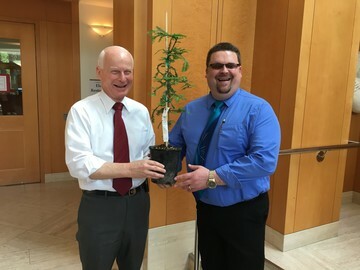 Presenting a tree to Secretary of State Richardson at the State Archives building. State Treasurer Reed in the Treasurer's office at the Capitol. Oregon Attorney General Roseblum outside my office. 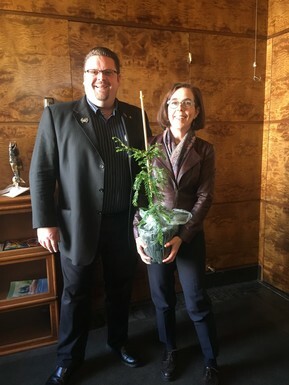 Presented two trees to the Lisa Sumption, the Director of the Oregon Parks and Recreation Department. 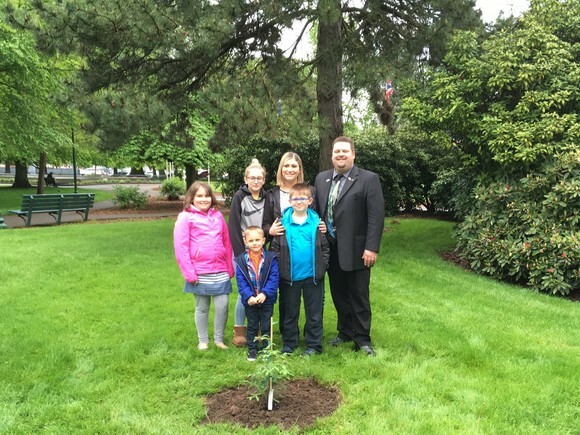 One of the trees is the one planted at the State Capitol. 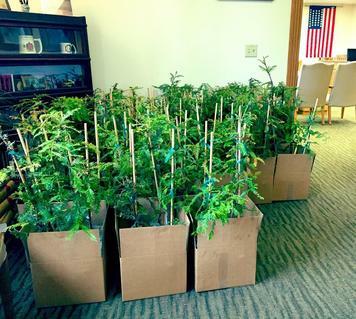 Trees that were gifted to the member districts of the House, Senate and offices of the Chief Clerk and Secretary of the Senate. HB 2499 (Vessel Permits) - A technical fix to the sales process of limited entry fishery permits. If the buyer of a vessel permit stops making payments to the seller, it is very difficult for the buyer to get the permit back. HB 2499 will help resolve this issue in two ways: 1. Allow the seller to get an injunction from a court to stop the buyer from using the permit until the case has been resolved in court. 2. Allow the Oregon Department of Fish and Wildlife, if an injunction is granted, to issue a temporary permit to the seller so that they can continue to use the vessel permit. This bill also offers better security to the permit seller many of whom use this as their retirement nest egg. The bill will also allow for a younger generation of fishers to afford these permits. HB 2500 (Caseworker Training) - Department of Human Services caseworkers often must attend court hearings to assist their clients. There is a concern that caseworkers may, inadvertently during court hearings, provide advice to their clients that could be considered practicing law without a degree. House Bill 2500 will allow DHS, in consultation with DOJ, to develop and implement a training and continuing education curriculum that will provide caseworkers with clear parameters on their role in courtroom proceedings. HB 2900 (Port Advertising) - Will allow ports to advertise to their own activities. Ports hold annual events that often are the highlight of the season, such as The Slamin Salmon, the Pirate Festival and the Azalea Festival for the Port of Brookings. 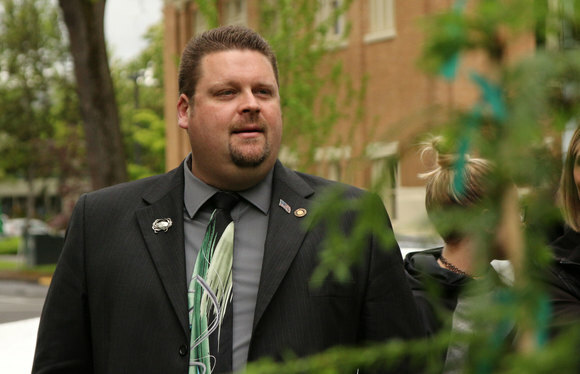 House Bill 2900 would allow ports to advertise these events to its users, to the surrounding communities and region. 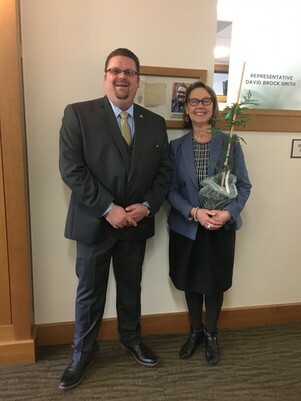 HB 3147 (Hatchery Appointments) - Requires that BEFORE appointing someone to this board the Oregon Hatchery Research Center Board, the Director of the Oregon Department of Fish and Wildlife will consult with organizations that represent the interests involved in the work of the research center. HB 3432 (Survey Maps) - Changes the word "must" to "may" so that a county and a private surveyor to work out issues without requiring disciplinary action by State Board of Engineering and Land Surveying. HCR 8 - Celebrates the 50th anniversary of the Oregon Beach Bill. Friday, May 19th - Bills must be scheduled for a work session. Friday, June 2nd - Bills must have had a work session and moved out of committee. It is is honor and privilege to work for you as your State Representative. Thank you for the opportunity and God Bless.